It’s no secret your mind and body require a good night’s sleep. Sleep is where your mind and body can rest, recover and repair from the activities of the day just past and prepare for the next day ahead. Proper support from your pillow means your head and neck is balanced and in alignment with the rest of your body whilst you sleep, thus the nerves in your neck are not stretched and irritated. You sleep for about a 1/3 of a day, which roughly equates to 1/3 of your life. On an average 6-8 hour sleep cycle, that is a long time to not be properly supported. Imagine 1 week, 1 month, 1 year and you get the idea your choice of pillow is either hurting or helping you. 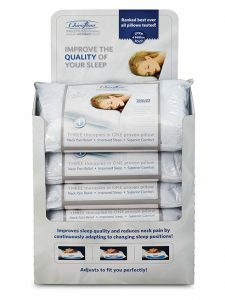 Some pillows may be comfortable and some may be supportive, but only the Chiroflow Waterbase Pillow gives you the continuous comfort and sustained support as you move throughout the night. 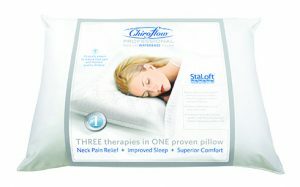 The Chiroflow pillow has two key design concepts, a hypoallergenic fibre top and a Waterbase bottom. The hypoallergenic StaLoft™ Premium Performance Fiberfill creates a deep cushion for luxurious comfort and superior performance. It is great for people of all ages with or without allergies. The Exclusive Waterbase design is where this pillow supersedes its competitors. Since you cannot compress water, when you move your head and neck whilst you sleep the water instantly moves, adapts and conforms to support your head and neck responding instantly with no lag time. You can leave it empty or fill it up to its 5L capacity. Take complete control of its firmness at any point in time, whereby the more water you put in the firmer the pillow, the less water the softer the pillow. Often people use gel and memory foam pillows of all shapes and sizes, featuring different built in neck supports, which can be uncomfortable if you are not the prefect fit for it. Also they assume that you go to sleep one way and wake up the following morning in the same position not having moved all night. 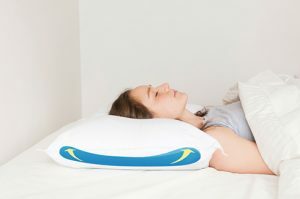 We all move throughout the night whether it be 1cm or 10cm, whilst these types of pillows can be supportive for a certain number of people, these pillows cannot instantly respond to your head and neck movement like sleeping on a waterbase pillow can. This is why we recommend and sell the Chiroflow Waterbase pillow, knowing full well it will give comfort and support to your head and neck after receiving chiropractic care.